Pro kiteboarder Wes Matweyew at Mudjin Harbour, Middle Caicos. 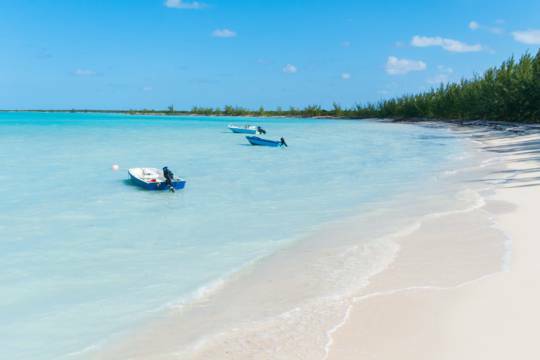 For the experienced kiteboarder, North and Middle Caicos offer endless beaches, wetlands and shallow to explore. Due to the simple fact that there’s typically no one else around at most spots, be aware that you’ll be on your own if you run into difficulties. See Wind, Waves and Tide for a current weather forecast, and Turks and Caicos Kiteboarding for information on kiting throughout the Turks and Caicos. Making up by far the most land mass in the Turks and Caicos, the causeway connected islands of North Caicos and Middle Caicos offer tremendous potential for experienced kiters. There are countless beach, wave and wetland spots waiting to be explored. Pro kiteboarder Hope LeVin at Cedar Point, Middle Caicos. As is the case throughout the country, the most predictable and consistent wind is the east southeast trade winds. The islands typically experience this wind on and off over the year, but it’s usually a bit more pronounced and regular in the winter months. Squalls and regional storms occasionally cause different wind directions, which make north and west coast locations a bit more viable. However, these winds are uncommon and unpredictable. 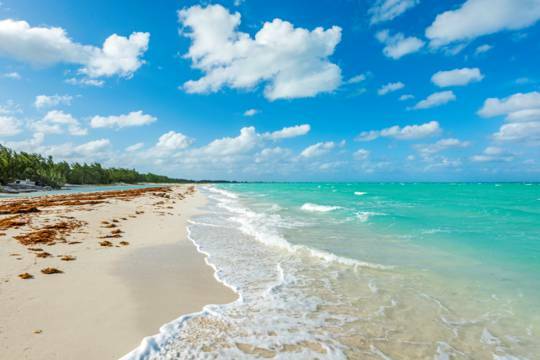 Due to the wind typically being offshore at many beaches and to the remoteness of most spots, we don’t recommend North Caicos and Middle Caicos to new kiters. There’s often simply no one around to help if you get into difficulties. 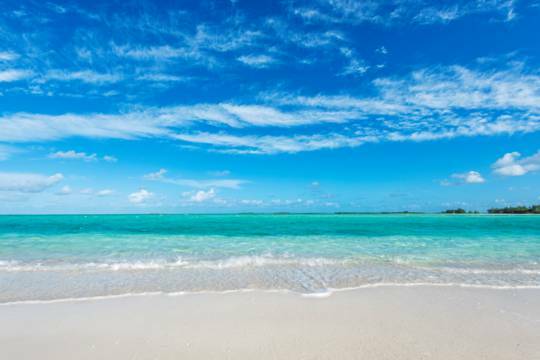 If you’re beginning the sport, Long Bay Beach on Providenciales is the safest and easiest place to practice. 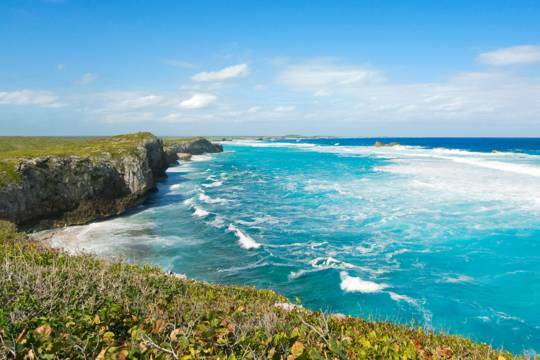 The coasts of North and Middle Caicos are typically deserted. You will likely be on your own if you run into difficulties. Be aware of offshore wind. Such conditions can blow you out into the open ocean. Take plenty of drinking water. Many locations are quite remote. Don’t exceed your skill levels. We advise kiting at Long Bay on Providenciales for most as the conditions and location is simply safer overall. Unfortunately, there’s very little technical support for kiteboarding on North Caicos and Middle Caicos. Providenciales is definitely the home of kiteboarding in the country. Lessons, kite downwinders, rentals and repairs can be arranged from one of the local kite schools on Providenciales, but costs will be higher. If you’re looking to pick up the sport, you should seriously consider staying on Providenciales and learning at the unparalleled kite spot of Long Bay Beach. 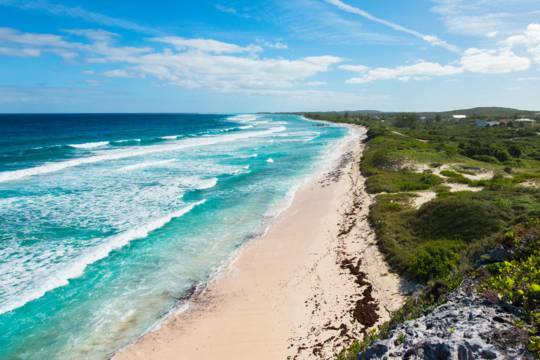 North Caicos and Middle Caicos offer a huge array of locations for the skilled kiteboarder, and we recommend simply renting a vehicle and exploring until you find something you like. The road layout over both islands is quite linear, and if you start at Sandy Point on North Caicos (where the Providenciales ferry lands), check out the Whitby and Horsestable beaches, and then continue on through Middle Caicos, you’ll get a good idea of what’s viable on the two islands. Below are some of the spots worth considering. One of the nicest kite spots on North Caicos and Middle Caicos, Cedar Point is unfortunately quite remote. Much of this area offers shallow water with a clean sandy bottom. The common east southeast trade winds can be a little offshore at times, but typically not by much. One of the more sheltered beaches on the two islands, Bambarra Beach is another location to consider. The water depth in this area tends to range from very shallow to too deep to stand. Be aware of the usually semi-offshore wind and the tall Casuarina trees that line the beach. Due to being quite close to the barrier reef, this highly scenic beach often has a swell and some waves. Beware of getting blown downwind or crashing your kite on the cliffs as the breaking waves can be quite rough and a hike back up the ironshore coastline will be nasty. Wind is typically offshore. Like Mudjin Harbour, Conch Bay Beach is quite close to the barrier reef and deep water and often has at least small waves when the wind is up. Although a decent wave spot, it’s important to understand that wind is typically offshore at this beach. Much of this area is steep rocky beach. This three mile long beach may be the safest and best kite location on the two islands. Unfortunately, the area is remote and access is difficult. Wind is typically on shore at this beach, and the water is a bit flatter than at most other spots.